<--- This is a pic of Loki. I took it several weeks ago with my phone camera. Which is why the quality isn't the best. 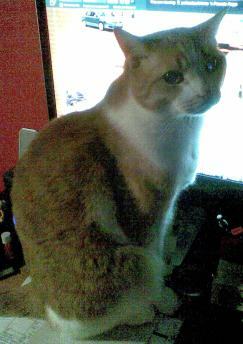 Still, as you can see, when he sits on the desk right in front of me, I can't see a darn thing. I know he does it on purpose, too. And this makes me laugh. It seems like only yesterday--oh, okay about 4 years ago--when he could lie down across the desk and comfortably go to sleep on it. He's just too big now, and only does this when he really wants to get my attention. I've been busy today. Busy writing up a storm. Seriously, I'd written over 6k words by the time I headed out to meet hubby and daughter at her school. Then, later on, hubby went over to my MIL's house to help her with something and took my daughter too. I decided to add some more words, and ended up with 2k more. After dinner, hubby got stuck into watching the footy and I just had the epilogue left to write, so I wrote it. I couldn't help it, though. I was at a bit in the story where it was all playing out really fast inside my head and I was totally in the zone. So I let my fingers go nuts on the keyboard and got it all out. Now, I'm not going to look at it all weekend, but on Monday I'll read the last four chapters to make sure that it all makes sense, lol. Word count is now up to 90,263. Not a bad number! Phew. I'm so darn tired. Managed to squeeze in a weights workout tonight, too. Now, I think it's time to take it easy. And then get some sleep soon!